A genealogy of both Biblical and Huffman’s characters. A bestiary that tells you the difference between a creodont and an indrik. A preview of Fallen: Book Two of the Antediluvian Legacy. 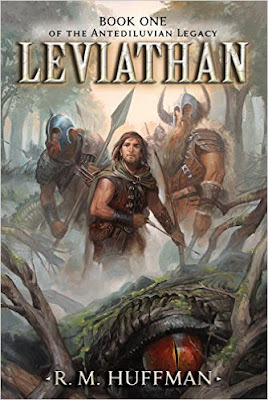 What makes Leviathan stand out, in part, is how lived-in Huffman made the setting, the theology. When one farmer says to another, “Toil, plants of the field, sweat of our faces…we’ll be well aware of the ground’s curse for certain,” it makes sense: they’re the Biblical Adam’s heirs, just a few generations from the Fall, and they know it. They live it every day. This is reinforced by the fallen Watcher angel Azazyel saying, much later, “We watched as Adam was made, and then we watched him ruin everything. And now, Samyaza is paying the price for Adam’s loosing of death into the world.” Despite the fantasy theme, we know these characters from Bible study. Some of my favorite parts of Leviathan were the references to other places, adding to the richness of the world. Kenan, a former adventurer, says to Noah, “I slew the high priests of the Om-Ctherra snake cult, along with its monstrous ‘deity.’ I fought a warlord-sorcerer, possessed by one of Satan’s princes, with the Nomads of Nod.” Kenan becomes Howard’s Conan, or even Moorcock’s Corum Jhaelen Irsei. If you want adventure in a fully-realized fantasy world that’s both familiar and mysterious, you’ve got to get Leviathan. And then tell Dr. Huffman to finish up Fallen already!